Stone Wall on the Lake — Ginger writes. I came across this poem sometime last year when I was looking through old homeschool stuff. I immediately made copies and distributed them for memory work the very next day. The boys no longer bat an eye when I start the breakfast conversation with, "Guess what? We get to memorize something else!" What a great poem to learn, with its sing-song rhythm and the vivid throwback images. I don't have a horse or a hoe, and I do very little manual labor. Yet how could words on a page portray any more meaningful and relevant message than this poem does? We say many of the same prayers every week at our little Anglican gathering that is Village Church. Pastor Seth tells us that we say the same things again and again because we need our mouths to tell our hearts what to believe. When I speak the words of this Frost poem over and over again, as Bauer and Cash and I practice it in turns, I am telling myself that people are more important than tasks. I don't keep forging ahead with what I'm doing and give my kids a half-glance and a hurried What is it, already? I don't focus on all that is still undone - the unfolded laundry, the unwritten blog post, the unmade beds, the unfinished photo album - when unspoken conversations and untapped friendships are at stake. Frost makes room for our stubborn hearts, I like to believe. That second to last line says we get to plod, to plod with our feet to take our hearts where they need to go. When I'm in task mode, and I get interrupted, my heart isn't always going to just cheerfully pick up and change course. So I get to stomp up that hill from the field I was hoeing and let my petty frustrations subside on the incline. I kick the dirt off my feet with each step and and before I know it, I'm there at the top of the hill on the side of the road, engaged in a friendly visit. 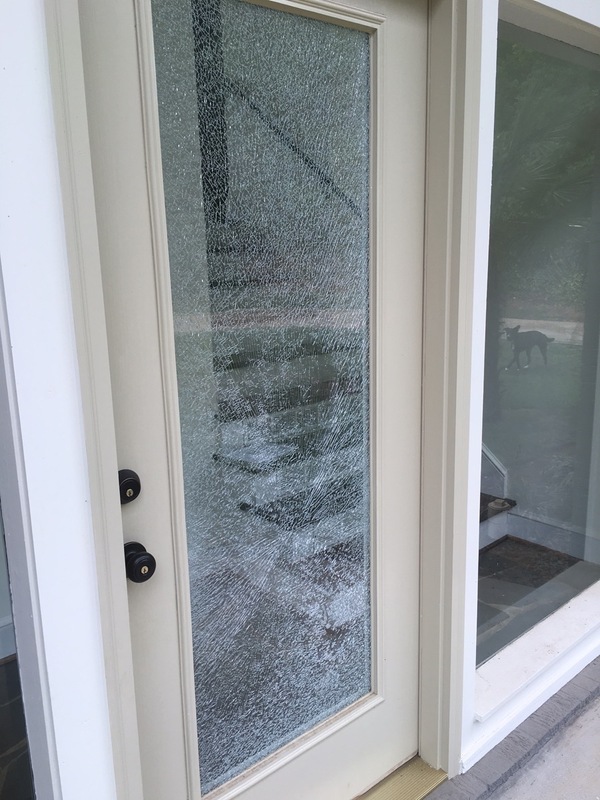 Last Friday, the lawn guys came to mow our yard, and while one of the guys was trimming or edging or whatever the manual labor term is, a rock got carried away and flew right into our glass front door, shattering the entire pane of glass. It looked like a million little pieces were just waiting for the right time to make a big ole mess for somebody to clean up (this would go in TJ's manual labor category). As it turned out, the inside pane of glass remained perfectly whole, and it was only the outside piece of glass that was broken. And even in the brokenness, TJ said it was one of those shatter-proof pieces of glass that won't fall apart even if it gets cracked like it was. We didn't know all of these details right after it happened. All we knew is that it looked like the whole door could come crashing in on us at any moment. I wasn't really worried about it, though, because I knew we weren't going to go near the front door. Even if something caused the glass to give way, no one would be in its avalanche. Story was inexplicably traumatized by the experience. I had my nanny Kasey watching the kids for part of the day so I could get groceries and work on my writing. It was when I came home from the store that I learned what had happened while the lawn guys were here, and then witnessed the state that Story was in. She was hard-crying, big tears, and saying over and over that she had never seen anything like that, and what if the glass falls down, and what if it lands on Sailor? I could tell she was not pretending or putting on for dramatic effect. I kept trying to talk to Story, to help her calm down and think rationally, to remind her that no one is going to go near the door so no one will get hurt. Just when we thought we had distracted her and calmed her down a bit, Story would start right back up, with the sobs and the sob story. Over and over, she continued to say she couldn't be alone because the glass might fall out. At this point, I had suggested that Kasey go outside with the other kids, to take Penny for a walk, thinking maybe Story would go along too and forget about the door. Story came back inside crying within two minutes and said she didn't want to go with them, so I told her she could play in the rec room while I made lunch. Within two minutes of that, she was back in the kitchen, crying all over again. I have no idea where these irrational fears of breaking glass were coming from, but my sweet Story was as scared as I've ever seen her. I say "my sweet Story" now because I know how the story ends, but in the moment, my patience was thinning as time continued to tick and I wasn't getting upstairs to write nearly as soon as I had hoped. All of Story's crying had tired her out, as her big yawn attested, so I said we should go put her in her bed for a nap. It was one last attempt to get rid of the situation, since none of my earlier attempts at calming her were working and I was finding myself more and more upset at her upset. Of course, Story was opposed to the nap, so at that point, I basically demanded that she stop the crying and go play in the rec room till Kasey got back. Then they could all have lunch together and everything would be fine. It was obviously my turn to be irrational now. Couldn't I see that Story needed me more than my writing needed me? This was my time to talk, as there always is a time to talk, if we will just recognize it for what it is. It won't always look like a perfectly-planned Starbucks coffee date, or a dinner conversation as a family. It might not even appear as a lovely homeschool discussion over what we noticed, wondered, or observed as we read our Story of the World history chapter together. Those are fine and come in handy to get us talking. But the talking I'm talking about, based on Frost's poem, might look more like what happened with Story the other day. It could also appear as some other little person who wants to talk about all the details of his birthday party for the twentieth time, or as someone bigger who wants to talk about the college football rankings all fall long. It's those inconvenient moments of engagement and conversation that can make or break the relationships that need more tending than any of the fields in our care. I am going to leave you to think about these things, and then I'll get to delight you next time with the perfect ending to the glass incident and Story's precious heart. God does beautiful things, in spite of ourselves.